To create a geoprocessing package, right-click a result in the Results window and choose Share As > Geoprocessing Package. Results are created when you run a tool using its dialog box or from the Python window. Results are not created when you run a model from within ModelBuilder. The illustration below shows the Geoprocessing Package window as it appears when sharing a result named Risk Assessment. The left pane is a table of contents. Clicking on each entry changes the right-side pane. Options for how you want to save the package. You can either upload it to ArcGIS Online or save it to a file on disk. Information about the packaging options can be found below. In this example, this is the result that was right-clicked to open the Geoprocessing Package window. In the right-side pane, you can enter a new name and update the description for the package. This is a description of the package you're creating. All package types are required to have a Summary and Tags. You can include additional files in your package. Typically, these are documentation files. Some file types cannot be added, such as executable files (.exe, .py, and so on). If checked, only the schema of the input data sources will be included in the package. A schema is the structure or design of a feature class or table that consists of field and table definitions, coordinate system properties, symbology, definition queries, and so on. Data or records will not be consolidated. This option does not apply to project data. Project data is input data that is not a parameter; that is, the data is not supplied by the user of the tool but is used internally by the tool. All data and records for project data will be included in the package. If you check this option, any data that resides in an enterprise geodatabase will be extracted from the enterprise geodatabase and converted into a file geodatabase and included in your package. Not checking this option means that datasets residing in an enterprise geodatabase will continue to reference enterprise geodatabase data, and the recipient of your package will need to have access to the enterprise geodatabase to use the data. This option will only appear if you have enabled support of ArcGIS Runtime in packages. 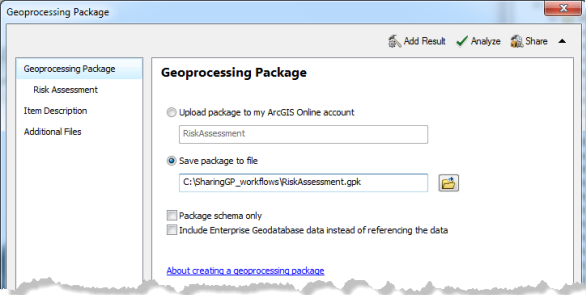 Check this option if you want your geoprocessing package to be able to be used in an ArcGIS Runtime application. To enable this option, click Customize > ArcMap Options in the ArcMap main menu. This opens the ArcMap Options dialog box. Click the Sharing tab and check Enable ArcGIS Runtime Tools as illustrated below. Beginning with ArcGIS Desktop10.2, you can modify parameters for a Runtime-enabled geoprocessing package in the same way you modify task parameter settings for geoprocessing services. See Overview of geoprocessing task settings for more information about modifying service task parameter settings. Runtime-enabled geoprocessing packages are typically used by custom-built ArcGIS Runtime applications. If you use a Runtime-enabled package in ArcGIS Desktop, it will execute like a geoprocessing service instead of a regular geoprocessing package. Consider creating a second non-Runtime-enabled geoprocessing package if you need to support use in Desktop. There are four buttons along the top of the Geoprocessing Package window. A geoprocessing package can have more than one result. This button adds a new result to your package. Analyzes all the results in your package for errors. Creates the package file or uploads it to ArcGIS Online depending on the option chosen in the Geoprocessing Package pane. Your package will be analyzed for errors, even if you've clicked the Analyze button previously. This collapses the Geoprocessing Package window to its minimum size. This is useful if you need to hide the window while analyzing your result or doing other work. You can restore the window to its original size by clicking the Expand button . When you create a package, ArcGIS analyzes the result for problems. Based on this analysis, you may have to provide additional information and, in some cases, rerun your result to create output data. There are three things you can do before you package to minimize problems. When packaging a result based on a custom model or script tool, your custom tool needs to be documented (system tools are already documented; it's only custom tools that need documentation). When packaging, ArcGIS analyzes your tool for a minimal level of documentation; your tool must have at least a summary, one or more tags, and a description for each parameter. The level of documentation you provide is up to you. If you're sharing your tool with a colleague in your workplace, then minimal documentation may be acceptable, since you're available to answer your colleague's questions. But if you're loading your package into ArcGIS Online, you want quality documentation so that your package can be used and understood by a wide audience. When you're packaging your result, ArcGIS checks for the minimal level of documentation, and if it's not present, you can pause the packaging process and write your documentation. This isn't a good practice; you are usually in a hurry to complete the package, and your documentation reflects this. It is better to take your time and provide quality tool documentation before you create your final package. In ArcMap, browse to your tool that created the result in either the Catalog window or the ArcToolbox window. Right-click the tool and select Item Description. In ArcMap, browse to your tool that created the result and select it in the tree view, then click the Description tab. In the Item Description window, click the Edit button . In the Tags text input box, provide tags. Tags are used by search engines. In the Summary (Abstract) input box, provide a short and concise summary of your tool. Note that a package can contain additional files, such as Word or PDF documents, where you can provide more detailed documentation. This summary is also used by search engines. In the Syntax section, expand each parameter and make sure the Dialog Explanation is populated. If it is empty, add appropriate text. When you're satisfied with your documentation, click the Save button . Tags, summary, and syntax are the minimum requirements for packaging. You should, of course, go beyond the minimum requirement and provide usage notes, code samples, images, credits, use limitations, and a scale range for your tool. Additionally, for custom model tools, you can add labels to your models within ModelBuilder. For custom script tools, meaningful comments in your Python code are welcomed by anyone reading (or debugging) your code. In addition to documentation for the tool that created the result, you'll need to provide documentation for your package. This is done during the packaging process. A good idea is to write a description of your package using your favorite text editor prior to making the package, then copy and paste this text into the package description. When packaging, ArcGIS uses the summary and tags from your tool as the initial package documentation. If your package contains more than one tool, only the summary and tags from the first tool are automatically added. In this case, you should edit the package's summary and tags with information that describes all the tools in your package. Results are created by running a tool, and you need a valid result before you can create a package. When packaging, ArcGIS analyzes your result and copies all input and output data to the package. If this data cannot be found, you'll receive errors, and you'll have to correct them before you can continue packaging. The most common problem with data not being found during packaging is that you're packaging a stale result. A stale result is typically a result found in the Previous Session node in the Results window. Between the time the result was created and the time you packaged the result, your data has either been deleted, moved, or renamed, and cannot be found. To rerun a result, right-click the result and choose either Open or Re Run. Rerunning ensures that all input and output data can be found. You can then package the new result. You can create a geoprocessing package with the Package Result tool. Once your geoprocessing package is created, you can share it on ArcGIS Online using the Share Package tool. You cannot share an invalid result, as illustrated below. There are times when you may want to share an invalid result with a colleague for troubleshooting. You can share an invalid result by using the Consolidate Result tool, as follows. Open the Consolidate Result tool. Drag the invalid result from the Results window into the Result parameter. Provide a value for the Output Folder parameter. Change any of the optional parameters or use their default values. In Windows Explorer, browse to the location of the output folder. Use the ZIP compression utility to compress the folder into a .zip file. E-mail the .zip file to your colleague. They can unzip the file and examine all aspects of your tool.